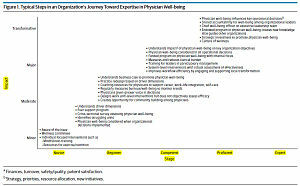 Physician Wellness - What is the Level of Expertise in Your Organization? In this post let me show you two important new developments in the prevention of physician burnout. 1) The definition of Five Levels of Expertise in Physician Well-being as proposed by Tait Shanafelt et al in an important new study. 2) A new way for your organization to leap frog to LEVEL FIVE in a single step. Take a look at the table below and LEAVE A COMMENT telling us the level of your organization's expertise in preventing physician burnout. 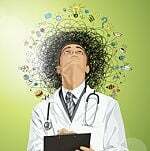 An important new article about the prevention of physician burnout was just published in JAMA Internal Medicine. It comes with the provocative title of The Business Case for Investing in Physician Well-being. The article is a must read for any physician leader who understands the importance of the Quadruple Aim. I have included a link to the full article at the end of this post. Where does your organization fall in this hierarchy?? Note that well over 50% of healthcare organizations nationwide in the USA are struggling to hit Level One. If that is true for you and your employer, don't lose hope. There are proven methods to leap from Level Zero to Level Five in a short period of time if your senior leadership is willing to support the Quadruple Aim. This is a very controversial point that deserves additional discussion. Many of these points are aspirational. I am only aware of one CWO. The lead author of the study from which this table is adapted, Tait Shanafelt MD, was hired into that position by Stanford in 2017. The only endowed chair of Physician Wellness I am aware of was created in 2017 at the University of Alabama Birmingham. Where is your organization in the table? What is the level of support for investing in physician wellbeing in your senior leadership team?